Welcome to Geek Fuel! Receive a Bonus Star Wars Item in Your First Box! 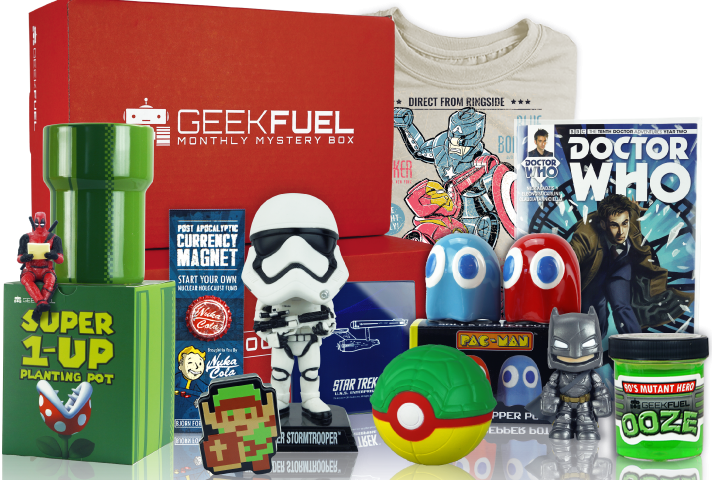 We are thrilled to introduce Coffee With Kenobi’s latest affiliate, Geek Fuel, the geek and gamer mystery box you can have delivered to your door every month! Each box contains at least $50 worth of geeky goodness, including exclusive t-shirts and gear, downloadable games, collectible toys, and much more! Products range from Star Wars, Doctor Who, Marvel — pretty much anything for the discerning geeks, gamers, and comic book fans in your life, especially you! It’s like getting a birthday present delivered each and every month. Whatever plan works best for you! Select your preferred Geek Fuel plan via Coffee With Kenobi and receive a bonus Star Wars item in your first box! January boxes are shipping soon, so don’t delay! Thank you to Geek Fuel for the images and information. Previous article A Sith Unleashed in Your First Look at STAR WARS: DARTH MAUL #1!